Hey, I just released the hack that recently led me to post a few questions here. It's basically a tweak to the story such that General Leo survives and becomes one of the 14 permanent party members. Let me know if you try it and what you think of the project! 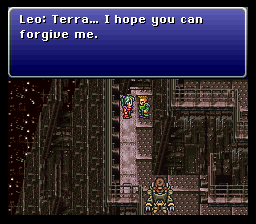 One of things I always wanted in FFVI back in the day was to have Leo as a competitive party member. He was cool, had a major man-to-man respect for him. The good thing about the games those days were where you could see a snippet of the character's personality and then use your imagination, too. I am as curious as Madsiur on this...Is there any way you can upload a YT video as a teaser on the new content of your hack? fedorajoe, I doubt you are still with us on the forum but I got a question. 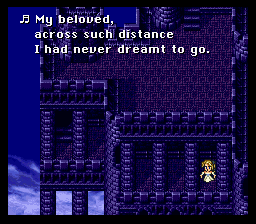 What kind of tool you used to integrate Golbez as a party member in your FFIV project? I'm curious. Hello everyone! Thank you for taking a moment to reply to my notice! First, I want to report the discovery of a pretty serious bug in the hack, which will be repaired in the next release. After the Thamasa events, when you are prompted to "Find the Floating Continent," Lift-off," or "Not just yet," you MUST choose "Not just yet," or Leo will not be added to the party. I am reeeaaally kicking myself for not catching this, but that's what happens when you don't have playtesters, ha ha. Regarding a teaser video, it actually was my intent to do a promo video, and I would still like to make one (as I did for my Golbez Edition hack and Phantasy Star II Modernization hack). However, my video software is broken! Hoping to have it fixed within the next week or so. If you guys have any specific questions about the hack, feel free to ask away! Normally I don't like to divulge spoilers or tricks of the trade, but I would consider it a "professional courtesy" to do so on this particular forum. Something I was wondering was if you'd be able to put Shadow back as a playable character full time with another hack (mod, really.) that allowed you to use a certain item to place 'temp' characters in your party. I believe it's featured around here somewhere, but not quite sure where. (09-29-2013, 03:24 AM)RaikouGilgamesh Wrote: Something I was wondering was if you'd be able to put Shadow back as a playable character full time with another hack (mod, really.) that allowed you to use a certain item to place 'temp' characters in your party. I believe it's featured around here somewhere, but not quite sure where. I wasn't really interested in going that route. I still wanted a character to die so as to preserve the emotional impact of the Thamasa events. Besides, I needed somebody to be the recipient of the Thamasa grave site. Why couldn't you replace Strago?